Get everything you need to re-create this festive holiday pendant. Kit includes Christmas tree pendant, all the dangles shown, 10" of wire & a large jump ring. Real pearls are glued on (the kid does not come with glue). Enjoy! Get everything you need to re-create this inspiring adjustable leather thong necklace. 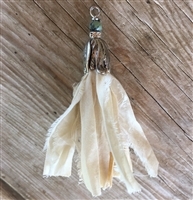 Kit includes all the dangles shown with jump rings & head pins, inspiration ring, leather strand, large hole bead to make the necklace adjustable and cord ends. This kit is priced at over a 25 % off savings! Enjoy! Get everything you need to re-create this stunning tassel necklace. You will receive 3 feet of chain, 3 twisted rope jump rings, a vintage replica floral rosary connector & EZ fringe tassel. This kit is priced 15% below retail! Enjoy! 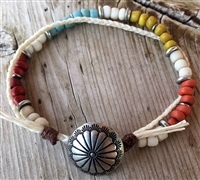 Get everything you need to re-create this trendy concho button bracelet. You will receive three 2' strands (6 total feet) of off white waxed linen cord, one 3' long and one 12" long (4 total feet) of dark brown waxed linen cord, a concho button, 9 large silver colored spacer beads and 6 small silver colored spacer beads, 25 off white Indonesian glass beads, 9 each of the mustard, dark turquoise, burnt orange & Boston baked bean Indonesian glass beads. Enjoy!